As regular followers of my Twitter feed (@AlanBarrierEA) might be aware, I have recently become one of the flood forecasters based at the Thames Barrier. I've spent the past couple of months shadowing the existing team of flood forecasters, who between them have several decades of experience of the tidal Thames. There has been plenty of experience to learn from as I complete my training. My new role comes nearly six years after I started working at the second largest flood defence structure in the world. With around 375,000 properties and over 1.25 million people either living or working in the flood risk area, there is a lot of pressure to get it right. I am now based in the Control Room at the top of the tower that overlooks the 520 metres wide wall of steel across the River Thames in Woolwich. Shift work doesn't bother me too much. In February 2014, I worked 10 consecutive night shifts as part of the team that closed the Thames Barrier for a record 20 tides in a row. Fortunately, this winter has been much quieter, with just one closure so far. The Thames Barrier flood forecasters work a 12-hour shift on a set pattern that ensures our team can monitor the tides 24 hours a day, 365 days per year. We don't decide whether we should close the Thames Barrier, but we provide the Duty Controller – the person who decides whether to operate the Thames Barrier or not – with all the information they need to make the call. There are several elements that we use to forecast tide levels in the Thames Estuary. Firstly, there is the astronomical tide, governed by the gravitational pull of the sun and moon, which generates a high tide twice a day. These can be calculated years, decades, even centuries in advance. We use a gauge at Southend as a reference point, then monitor each tide as it travels up the River Thames, reaching the tidal limit at Teddington Weir around 2.5 hours later. On top of that, we have surge to consider. This is formed by the weather patterns in the North Sea. During the storm of December 2013, for example, our monitoring gauge at Southend saw nearly a metre of surge on top of the astronomical tide, providing the highest tide since the Thames Barrier became operational in 1982. Our forecast for that tide was within one centimetre of the real tide. The weather can also cause the reverse effect. In mid January, we had a large negative surge which resulted in a very low high tide at Southend, and virtually no tide at all once it reached Teddington Weir. We also look at what is coming the other way – the flow from the non-tidal River Thames coming into central London. Where the two sources of water meet, it can have a huge effect on predicted river levels. The high river flows of February 2014 resulted in the majority of the 50 closures last winter. If there is no requirement to close the Thames Barrier, then it's still possible that a flood alert needs to be issued for riverside areas upstream of the Thames Barrier. During 2014, we had to issue such alerts for over 100 tides whether the river could flood low lying roads and tow paths between Putney Bridge and Teddington Weir. During the daytime, there is always a hive of activity in the Control Room. Our team of electricians and mechanics, who carry out maintenance work on the Thames Barrier, are in regular contact with the Shift Engineer. He also sits in the Control Room, where he monitors all of the sensors that are in place on the piers and gates. We are in regular contact with the Port of London Authority. This means if we need to take control of a span – the space between two piers where each of the nine gates sit – for any reason, such as a gate move or carry out routine inspections, we have the authority to do so without disruption to river traffic. We also have to keep an eye on our network of tide gauges. Levels come into the Control Room every 60 seconds. If a fault should occur, we would need to investigate it immediately and, if required, send out one of our experienced team. I'm really looking forward to my new role and the responsibility that goes with it. I think I now have one of the best office views in the Environment Agency. in volume of river water has need to exit the Thames after the tide turns ? Good Morning, The Thames Barrier is part of a network of defences from Southend in the Thames Estuary to Teddington in west London. In total, the network of defences stretch for 185km on both sides of the river. All defences protect properties from a 1 in 1000 year flood event. These include not just the Thames Barrier, but other smaller barriers at Dartford and Barking, flood gates, river walls and embankments. Inspections are carried out at least every 6 months on our flood walls, embankments and flood gates to ensure they continue to offer our high level of protection. 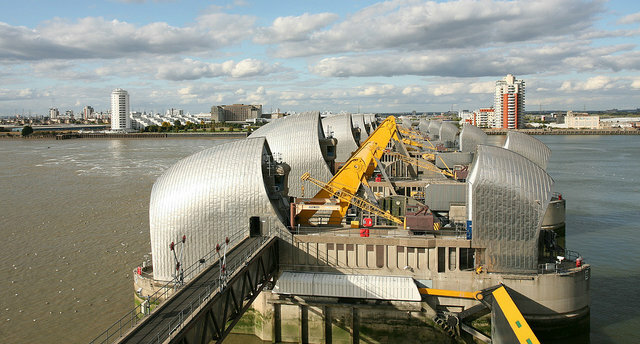 Defences downstream of the Thames Barrier will still offer the same level of protection with the Thames Barrier closed. As such, the difference in the height of the defences is around 2m either side of the Thames Barrier, for example. During a closure, river levels downstream are higher to what they normally would be, but all water is contained within our defences. In fact, during any closure, we have not come to within two metres from the top of the river walls, so we have not yet come close to an overtopping event. what does a 1 in 1000 year flood event mean as I understand that it doesn't mean what you think? The definition here refers to a flood event that has a likelihood of 1 in 1000 (or 0.1%) in any particular year.